심층 학습은 신경망을 사용하여 데이터에서 특징의 유용한 표현을 직접 학습합니다. 예를 들어, 사용자는 사전 훈련된 신경망을 사용하여 영상에서 가우스 잡음을 식별한 후 제거할 수 있습니다. Use a pretrained neural network to remove Gaussian noise from a grayscale image, or train your own network using predefined layers. This example shows how to remove Gaussian noise from an RGB image by using a pretrained denoising neural network on each color channel independently. 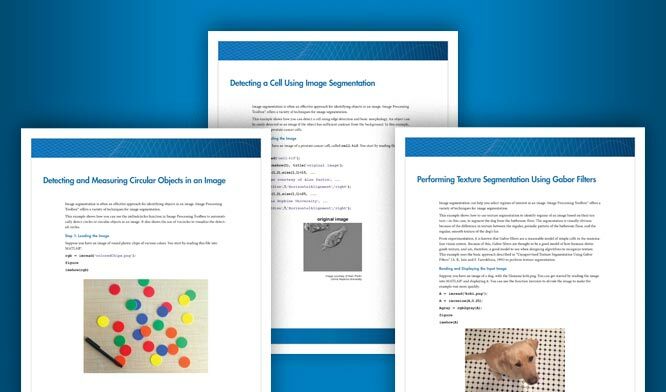 Create a high-resolution image from a single low-resolution image, by using the Very-Deep Super-Resolution (VDSR) deep learning algorithm. Remove JPEG compression artifacts from an image, by using a deep convolutional neural network trained with residual images. Use a deep neural network to process an image such that the resulting image resembles the output from a bilateral filter. Use a deep neural network to perform semantic segmentation of an image with data in seven channels: three infrared channels, RGB color channels, and a mask channel.